Thanks to Netflix I have watched soooo many wedding themed romantic comedies. Made of Honor, 27 Dresses, Mamma Mia, The Wedding Planner… Yes, I purposely requested all of these, and more. Renting movies that I know I’ll likely dislike may seem odd, but it’s a bit of a hobby I shared with my sister when we were both still living with our parents. We’d spend a couple hours in the afternoon watching subpar comedies and provide our own Mystery Science Theater style commentary. Just a bit of sisterly bonding at the expense of Katherine Heigl (actually, we quite liked that one). 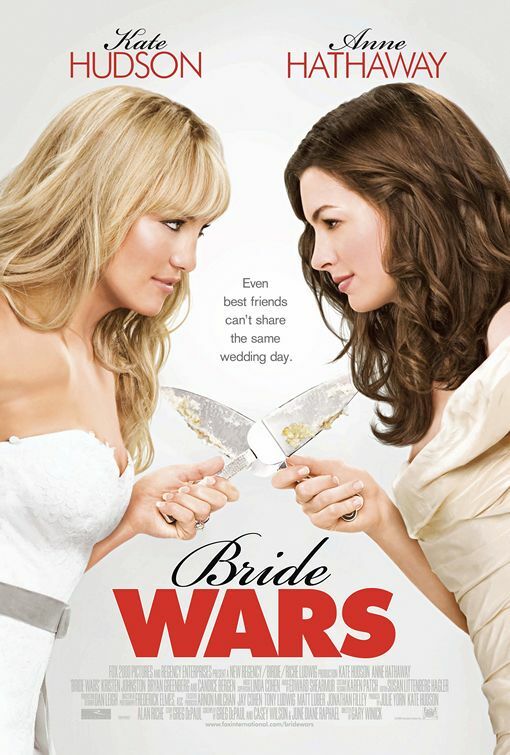 Bride Wars is not great, but the leads give funny enough performances to make up for most of the shortcomings. Kate Hudson is especially great. She obviously inherited her mother’s knack for comedy. Anne Hathaway is also funny, but doesn’t have quite the talent of her co-star. She was good in cute comedies like The Princess Diaries, but here she’s a bit of a mean girl/villain and it doesn’t suit her. The plot is pretty blah, playing on the bridezilla trope that I wish would just go away. Due to a mix up Hudson and Hathaway’s dream weddings at the Plaza Hotel are scheduled for the same day. These childhood friends try to come to a friendly agreement about who will move their wedding to another venue, but quickly dissolve into unfriendly oneupmanship as they attempt to sabotage each other’s big day. In the end they come to the realization that the weddings themselves aren’t that important, it’s the relationship with their future spouses and each other that really matter. But no one’s going to remember that, they’re just going to remember Kate Hudson making Anne Hathaway look like a walking carrot and Hathaway surreptitiously feeding Hudson chocolates and sticks of butter (though I’d recommend this movie purely for the “International Butter Club” joke). I mean, this movie tries. It sometimes hits the mark, but it sometimes misses the target all together. I appreciated the dynamic between Hudson’s financially successful character and Hathaway as an underpaid teacher. The resentment Hathaway has towards Hudson for throwing her money around feels real, as does Hudson’s obliviousness that buying expensive things for her friend might make her feel bad. But then you realize that a wedding at the Plaza would cost way more than Hathaway could afford on a teacher’s salary, even with a decade of scrimping and saving. And you have to question why an otherwise intelligent woman would throw that much money away on a single day? If Hollywood (or even the sitcom Friends) has taught me anything, it’s that all little girls dream about when they’ll get married and what a magical day it will be. Some even have the whole day planned and just need to find a suitable groom that can slot into his position in this fantasy. This movie is about two such women who have been planning their dream wedding since going to a wedding when they were young at the Plaza Hotel in New York. The two women, Liv (Kate Hudson) and Emma (Anne Hathaway), have been best friends since they were children and are equally excited for one another when their generic male companions propose within a few days of each other. Due to a scheduling mix up, their special days end up getting booked on the same day at the Plaza. This means one will have to move from the venue, as the Plaza does not have any other open appointments for years, or the weddings will have to go ahead on the same day seperately. Thus begins a tale of one upmanship as each friend tries to convince their friends that they should attend her wedding over the other. Eventually this leads to the two women attempting to sabotage the others wedding. I never quite understood why they would resort to such petty behaviour, but hey, I’m not a woman. I had a fantastic time at my wedding, and because I got married overseas, hardly any of my friends were there, and it was still a very special day. I think if the bride and groom want to be there, it’s really not as important who else is. This film has some very funny moments. Some of the things that happen to Kate Hudson and Anne Hathaway are quite amusing. A spray tan goes wrong for Hathaway, which is very funny because of her normally pale complexion. She ends up with bright orange skin after some of Kate Hudson’s meddling. In retaliation, Hathaway tampers with some of Kate Hudson’s hair dye and turns her hair blue. All of these things are played for laughs really well. Especially by Hudson, who has her mother’s (Goldie Hawn) comedic timing. Hathaway is good, but I don’t know if the comedy genre is right for her. I find her much more appealing when she is really acting in gritty pictures like Brokeback Mountain or Les Miserables. I’m not sure if Hudson is able to match it with Anne Hathaway in the acting stakes, which is why one of them has an Oscar and the other doesn’t right now. The best part of this film was Kristen Johnston though. She plays one of Anne Hathaway’s co-workers and ends up being her maid of honour after her friendship with Kate Hudson breaks down. She has some of the best lines in the film and I’m glad to see her back on the screen. This was the first thing I’d seen her in since playing Sally Solomon for six seasons in 3rd Rock from the Sun. Another relevant co-star is Chris Pratt as Anne Hathaway’s fiancé. He is charming as usual, but isn’t really given much to do. I’m glad he has found much more use of his talents on the fantastic sitcom Parks & Recreation. Overall, this movie is ok. It has some cute laughs, but is probably pretty forgettable.